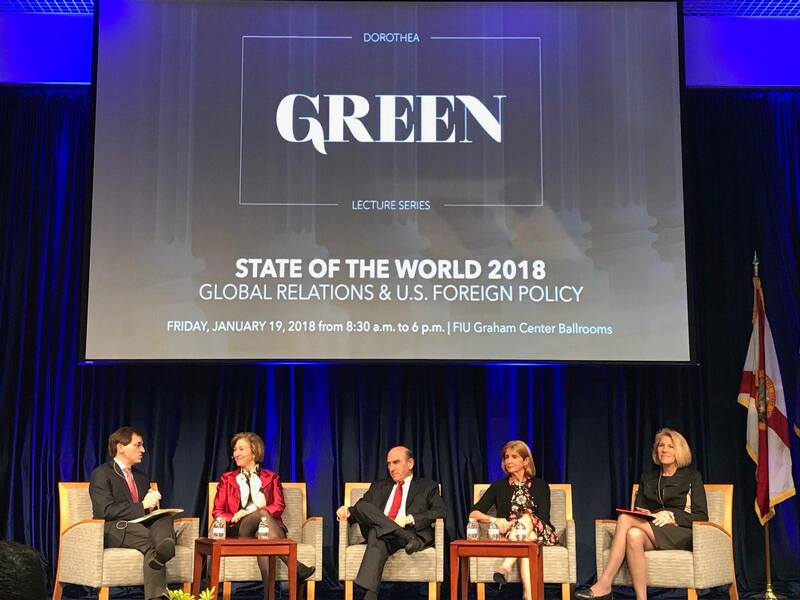 Peter Baker, Anne-Marie Slaughter, Elliot Abrams, Paula Dobriansky and Karen Donfried kick off the first panel of the State of the World 2018 conference. From leaders of nationally renowned think tanks to former ambassadors and journalists from The New York Times, The Washington Post and Politico, some of the brightest minds from across the country came together at FIU for a day-long conference on global relations and U.S. foreign policy. State of the World 2018, co-hosted by FIU’s Steven J. Green School of International and Public Affairs, the Center for Strategic and International Studies (CSIS) and The American Interest, featured panel discussions on some of the most pressing topics of the day, such as human rights, America’s standing in the world and current challenges in Cuba, Venezuela, the Middle East, China and Russia. The conference is the first of its kind in Miami – and a milestone for the Green School. It marked the inauguration of the Dorothea Green Lecture Series, created with the goal of bringing leading minds together to discuss critical topics of global importance. Green School Senior Fellow David Kramer was the lead organizer of the conference. Kramer comes to FIU with 24 years of experience working in Washington, D.C., including serving as president of Freedom House as well as assistant secretary of State for Democracy, Human Rights and Labor under President George W. Bush. He reached out to his extensive network and invited top names in foreign policy – successfully bringing together an impressive array of individuals to FIU for the event. One of the recurring themes of the conference was America’s role in the world and American identity – and how the foundational principles of universal human rights and liberty are not a burden for the United States, but the glue that brings the country together, effectively crossing party lines and differences of opinion. FIU experts also dazzled the stage. Brian Fonseca, director of the Jack D. Gordon Institute for Public Policy, tackled multi-faceted issues in a panel about America’s standing in the world. Julie Zeng, associate professor in the Department of Politics and International Relations, discussed the complexities of U.S.-China relations. A lunch conversation on Cuba and Venezuela featured Frank Mora, director of the Kimberly Green Latin American and Caribbean Center; Danielle Clealand, assistant professor in the Department of Politics and International Relations; Jorge Duany, director of the Cuban Research Institute; and Brian Latell, senior research associate at the Gordon Institute, with Fonseca moderating. FIU students also shined during the event, asking thoughtful, engaging questions at the end of each panel, captivating many of the guest speakers. Elisa Massimino, director of Human Rights First, thanked students for reassuring her that there are bright, future leaders in the making. William Inboden, professor at the Clements Center for National Security at the University of Texas-Austin, had high praise for FIU students and for the event. FIU College of Law students joined Slaughter at a separate event to discuss the future of legal education. The conversation was followed by a question and answer session on how educators can prepare students for the ever-changing landscape of the legal profession. Anthony Francisco, a member of FIU’s Model UN team, said he thinks the conference will be helpful as he works toward a career in the intelligence community. The State of the World conference is available for viewing online. To view the morning panels, click here. To view the afternoon panels, click here. Amy Ellis and Gregory Miller contributed to this story.